Beyond France’s own national historiography, the French Revolution was a fundamental point of reference for the nineteenth-century socialist movement. As Jean-Numa Ducange tells us, while Karl Marx never wrote his planned history of the Revolution, from the 1880s the German and Austrian social-democrats did embark on such a project. This was an important moment for both Marxism and the historiography of the French Revolution. Yet it has not previously been the object of any overall study. The French Revolution and Social Democracy studies both the social-democratic readings of the foundational revolutionary event, and the place of this history in militant culture, as seen in sources from party educationals, to leaflets and workers’ calendars. 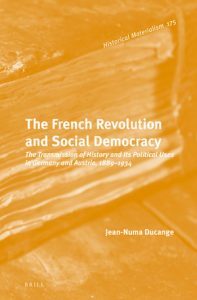 First published in 2012 as La Révolution française et la social-démocratie. Transmissions et usages politiques de l’histoire en Allemagne et Autriche, 1889–1934 by Presses Universitaires de Rennes in 2012. Plus d’informations sont disponibles sur le site de l’éditeur. La préface peut-être lue ici.